introducing….superman the dog…the very big dog! i took this picture saturday. it’s my friend debora, a dog trainer, and a dog we met at an animal fair. his name is superman. his owner says they don’t make doggie beds big enough for him so he has his own twin bed. anyway, all of my photos are copy written, but you all may take this picture and send it around if you want. he’s just so big. and i also need to mention that he was a very sweet dog. and he seemed quite used to having his picture taken! please stop biting my foot. care to write a caption? as much as he loves pickles, cody bear thought it was time he get away for some grown up dog adventures. naturally he thought it would be ideal to meet up with his travel buddy, checkers. but where to go? 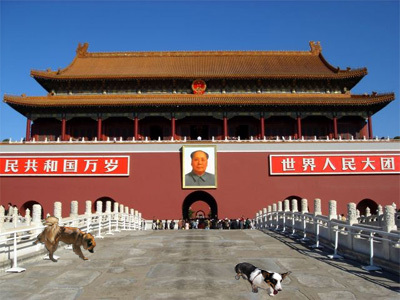 checkers had a suggestion: due to the upcoming 2008 beijing olympics, china was temporarily removing “dog” from the menus. at least that’s what he heard at wordpress. there would never be a safer time to visit….as long as they packed their own food…. souvenirs included: a new jade bangle for cody bear’s p.a., a print from the national museum of china for checkers’ p.a., a year of the dog pendant for cody bear’s p.a., a pair of panda socks for checkers’ p.a. and fortune cookie squeaky toys for scruff, nash and pickles. 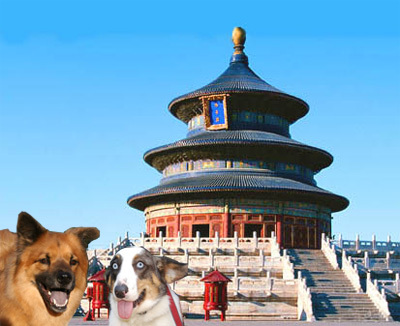 cody bear and checkers wanted to also mention that they brought a message of peace with them to beijing: please don’t eat dogs and please ease up on tibet and please use safe ingredients in your exported pet foods. the dogs agreed to skip the synchronized swimming events, neither of them loving water. they snuck into the gymnasium to see the women’s gymnastics, guessing correctly that the girls would go nuts when there were dogs to snuggle. ultimately, track and field was the most fun. snatching the relay baton and running hell-on-paws around the track, rolling on their backs in the long jump pit, and mocking the race walkers. well, they would mention more, but they both want to go wizz on the great wall before it is time to head home! Awrite. welcome tae mah blog. if yoo’re new haur, lit me summarize: mah blog includes, but isnae limited tae, dogs, random activities, silly things, scran, bevvy, volunteerin’, photography, wildlife an’ irritatin’ coworkers. well, hit looks dig me main geeza iz finally considerin firin me fresh main geeza. e just aint gettin’ anythin done. well, it loohks fancy one’s boss is finally considering firing one’s new coworkah. he fie isn’t getting anything done. poor jim. he needs to get workin’!